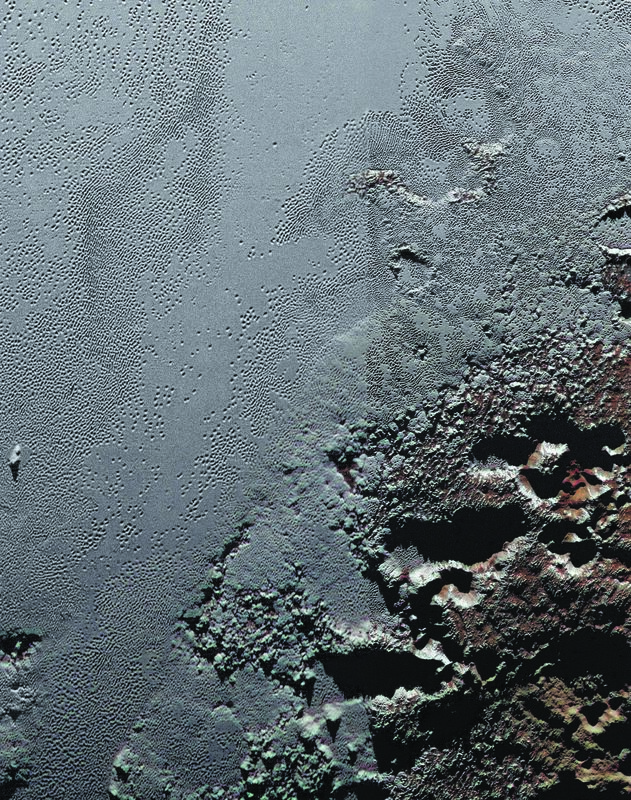 This enhanced color view from NASA's New Horizons spacecraft zooms in on the southeastern portion of Pluto's great ice plains, where at lower right the plains border rugged, dark highlands informally named Krun Macula. Krun Macula – Krun is the lord of the underworld in the Mandaean religion, and a macula is a dark feature on a planetary surface – is believed to get its dark red color from tholins, complex molecules found across Pluto. Krun Macula rises 1.5 miles (2.5 kilometers) above the surrounding plain – informally named Sputnik Planum – and is scarred by clusters of connected, roughly circular pits that typically reach between 5 and 8 miles (8 and 13 kilometers) across, and up to 1.5 miles (2.5 kilometers) deep. At the boundary with Sputnik Planum, these pits form deep valleys reaching more than 25 miles (40 kilometers) long, 12.5 miles (20 kilometers) wide and almost 2 miles (3 kilometers) deep (almost twice as deep as the Grand Canyon in Arizona), and have floors covered with nitrogen ice. New Horizons scientists think these pits may have formed through surface collapse, although what may have prompted such a collapse is a mystery. This scene was created using three separate observations made by New Horizons in July 2015. The right half of the image is composed of 260 feet- (80 meter-) per-pixel data from the Long Range Reconnaissance Imager (LORRI), obtained at 9,850 miles (15,850 kilometers) from Pluto, about 23 minutes before New Horizons' closest approach. The left half is composed of 410 feet- (125 meter-) per-pixel LORRI data, obtained about six minutes earlier, with New Horizons 15,470 miles (24,900 kilometers) from Pluto. These data respectively represent portions of the highest- and second-highest-resolution observations obtained by New Horizons in the Pluto system. The entire scene was then colorized using 2230 feet- (680 meter-) per-pixel data from New Horizons' Ralph/Multispectral Visual Imaging Camera (MVIC), obtained at 21,100 miles (33,900 kilometers) from Pluto, about 45 minutes before closest approach.